Today was Limoux’s Farmers Market. We had to wander around before leaving, checking out the quality of the fruits and vegetables, and other wares and were much impressed. A small bag of fruit left with us. We headed for Andora via Montsegur, the last bastion of the Cathars. We drove around the foot of the mountain to a small car park, planning to hike up to the top, A narrow dirt trail led way, way up to the castle. We decided to take pictures. Finally, standing in the middle of the trail, we looked up to the destroyed 12th century castle and gave homage to the Cathars. This final group of over 300 were burned alive for trying to establish their philosophy of life and make the world a better place. We remember you and bid adieu. Back to the car and on to Foix for lunch. The drive through the Pyrenees was absolutely breath-taking . 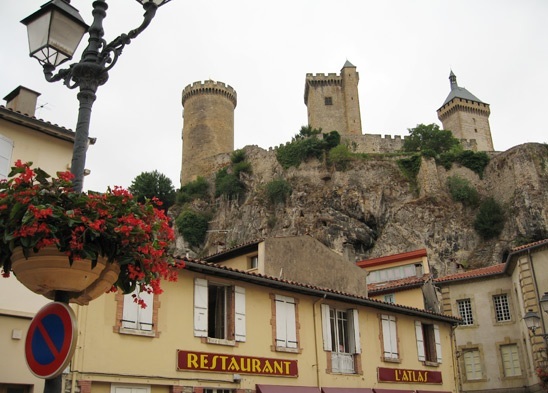 The first sight of Foix was the 13th century castle on a river just beyond and above the city. In the center of town, we found the large, open-sided but covered Farmers Market with one half set up for lunch and the other filled with small stalls for shopping. There were cast iron columns with wrought iron filigreed decor on the tops supporting the roof. It is hard to get the food in your mouth when there’s so much to look at….and you use a lot of napkins. It was a magnificent drive through; around and over the snow- capped Pyrenees. The countryside, lush with winding rivers and forests was faintly touched with Fall. 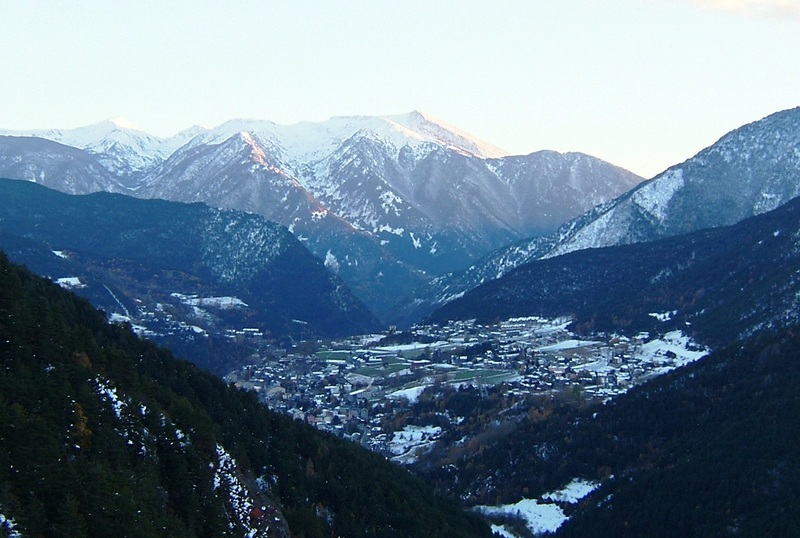 Our first view of the city was looking down from the top of the mountain to where Andorra nestled in a narrow valley. Driving through the city was an experience. New buildings, hotels, condos all became taller and closer as the high valley narrowed. Andorra promotes itself as a Winter Sports Resort, Right in the center of town is an enormous chair lift… it was not operating at this time…but it could have been the ride or a lifetime. In the 14 years since the city had become an autonomous country, it seemed to have become crowded, crass and controversial in its grasp for notoriety and money. Very interesting political background. On to La Seu d’Urgell and its lush parador of the same name. The Paradors were established by the Spanish government many years ago. The country was teeming with empty castles, monasteries, and nunneries. 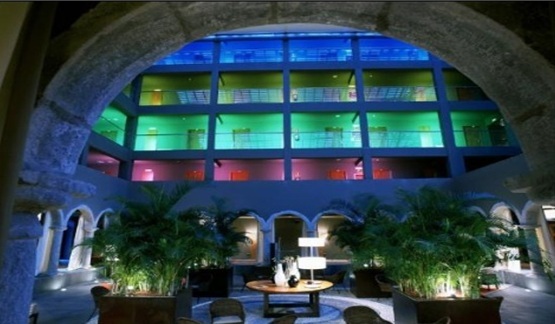 The government bought many of them modernizing the structures to the level of 5 star hotels. You will see in the picture that they did a fantastic job. Notice the arches surrounding the courtyard of this 12th century convent. It was kept as the courtyard of the parador but incorporated with the addition of a glass ceiling dome into the main sitting room. The luxurious bedrooms were built on the far side. I asked for a room with a terrace and spent the next hour sitting, drinking wine and watching the streams from the melting snow as it glimmered its way down to the valley. Need I say spectacular? Breakfast was overwhelming and, delicious. Full stomachs, including a glass of bubbly(or two), necessitated a long walk and another night here. We walked down to the 1992 Olympic site for water sports. A canoe practice for young people was underway with the necessary hooting; hollering and splashing. The older group following them were just as energetic but with less hooting. All the coaches and groups were well organized and the park was beautiful. That evening we walked to dinner in the old town and found a family run restaurant, Cal Teo. Christina, daughter of the owner and our waitress, spoke good English. She had a vacation coming and wanted suggestions. Since France was only 8 miles away and she had never been there, we had many ideas. She would not charge us for the wine. Back to wine on our patio and the fading light on the snow-capped Pyrenees. Less now than when we arrived. On to Grand Hotel Rey Don Jaime in Castelldefels by the Barcelona Airport. Our concierge graciously called ahead and confirmed our reservation. It was a good 5 hour trip so we had to hustle a bit. Mike frequently moaned about the wineries being missed but I reminded him of the excellent wine list at the hotel’s restaurant. It had been 5 years since we had made these same connections to the hotel and airport. Since then they had secretly rerouted the highway. We stopped in a small village…near, we thought, to the hotel, and using our limited Spanish, we were able to get explicit directions from the restaurant cook where we ate lunch. Bingo and a nice tip. It took about 15 minutes to arrive at the hotel. Dinner, with an excellent wine, was eaten on the patio over-looking the lovely swimming pool and the 12th century fortress tower…all overlooking the Mediterranean Sea. The only excitement that night was looking out the room window and spotting a large boar on the ground below….with four little stripped boarlets tagging behind. Their home was probably on the hillside behind. After breakfast we deposited our rental at the airport and, with the usual grace and ease, wended our way through the “priority” line for 1st class (obtained of course using miles for up-grades and calling Delta early). Wine in the lounge and again in our hands as we sit on the plane. A good view of the mountains as the plane rises….I love those mountains. In this case, some back-ground is necessary before the Journal can begin: a bit of history about the Templars or “Soldiers of Christ”. Most Americans are not familiar with these activists from the 11th century France. Historically the Turks captured Jerusalem in 1071 which ignited retaliation from the Catholic Church. In 1095, Pope Urban II launched the First Crusade that would end with the recapture of Jerusalem and offer salvation and glory to those “Soldiers of Christ” (the Templars) who fought the Infidels. After the success of this Crusade, the bulk of the warriors left the city in the hands of a small troop of Templars for the defense and protection of the pilgrims. In 1113 another pope approved the “Order of the Hospitallers of Saint John“ who would house and care for the “Walkers for God” pilgrims coming to Jerusalem. Then in 1119, Hugues de Payns formalized the brotherhood of the Templars as the “Poor Knights of Christ and the Temple of Solomon”. Their job was to defend the Holy Land. Installed in the former site of Solomon’s Temple, they pledged themselves both as knights and monks and lived as such. The Order of the Knights Templar was confirmed in 1139 by Pope Innocent II who placed them under his direct protection. They were a permanent militia charged with defending the Latin kingdoms. Also, in the West, they aided the Christian reconquest of the Iberian (Spanish) peninsula from the Muslims. Meanwhile their commandaries (huge agricultural estates either given to them or that they took over) produced wheat, barley, oil, wine, wool and cattle, supplied the resources to support their military expenditures. And their teaching agriculture to area farmers benefitted everyone. I loved your brief history of the Templars and Hospitaliers. What a rich story a somewhat unknown corner of France has to tell. You make me want to pack my bags and explore! Merci!